as you can see in this screenshot none of the 3 methods work. what am i doing wrong ? @frederic-raducki It says rather clearly "incompatible with the architecture" -- You're trying to install a package for ar71xx-architecture on a ramips device. It won't work. Also, installing nano from the repos should work fine. sorry i'm a noob in this field. May i ask you to point-out for me the proper repo where i should get packages from for the Omega2 ? @frederic-raducki You have to run opkg update to fetch the list of packages from the repos. This list is kept in RAM, so every time you reboot your device it's lost and you have to run the command again. 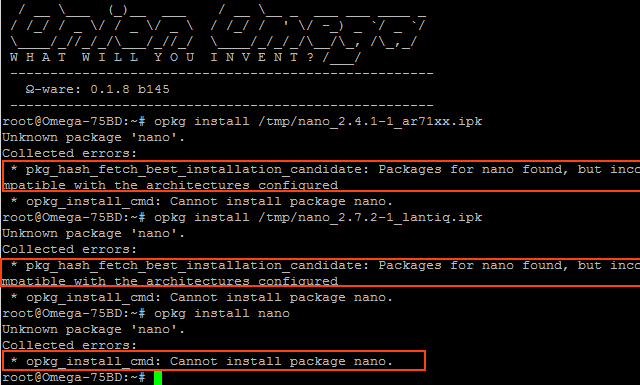 So, run the command again, then try opkg install nano and it should work fine. damn it worked ! thanks a lot. i was not aware you need to run this EVERYTIME after a reboot ! If you don't mind I'll be marking this as resolved so other people can find it in the future.